Before we get into the story of the Laureato as it stands today, let’s first step back a little. Not too far back, just to May of 2017, when Phillips Watches gathered for their fourth auction in Hong Kong. The headliner story there, if you recall, was the 43 watches that Laurent Picciotto had put up for sale from his personal collection. Many of these were early versions of watches along with a handful of unique projects that M. Picciotto pursued with brands that retail with the Parisian Chronopassion. With regards to the Laureato, lot 1017 was a Laureato EV03 Tourbillon of the three sapphire bridges variety — made specifically for M. Picciotto — that garnered a fair bit of attention. Revolution was in the room when the watch was being auctioned and without giving too much away, it was quite fascinating to witness the person who ultimately put in the winning bid. Now, we can’t tell you outright who this was, but be assured that this was a gentleman associated with the highest levels of horological scholarship, having written multiple books — most of which he does his own watch photography for — and is considered an authority of impeccable integrity. As he was bidding, just the sheer calm and measured way in which he proceeded, not only showed how seasoned this gentleman is, but at the same time suggested that he had interest in the EVO3 Tourbillon with Sapphire Bridges all along. The point in this little recollection? Simply that when you see a man of such credentials turn his eyes toward a specific timepiece, you know we’ve got something very special on our hands. And why not? 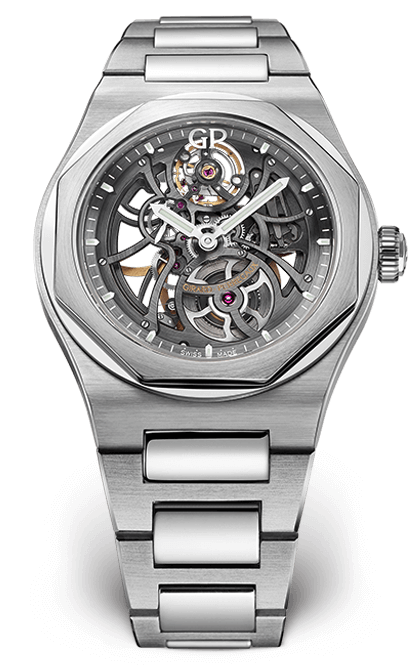 With the EVO3 Tourbillon with Sapphire Bridges what you have is Girard-Perregaux’s signature three bridges, patented by the maison in 1884, placed in a watch they created in the mid-70s — in the midst of the Quartz Crisis — but, of course, with its three bridges conceived in a material that all of horology is highly fascinated by in these early years of the 21st century: Sapphire. 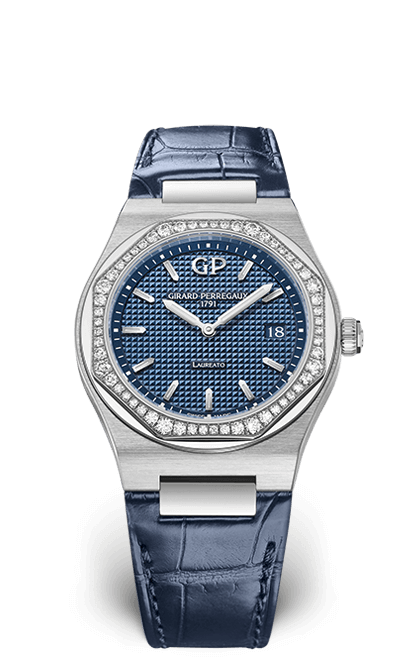 Mind you that in the early 2000’s, Girard-Perregaux might’ve possibly been one of the first few to have dared to use sapphire to create a movement component. Three timeframes worth of milestones are held within this one watch. 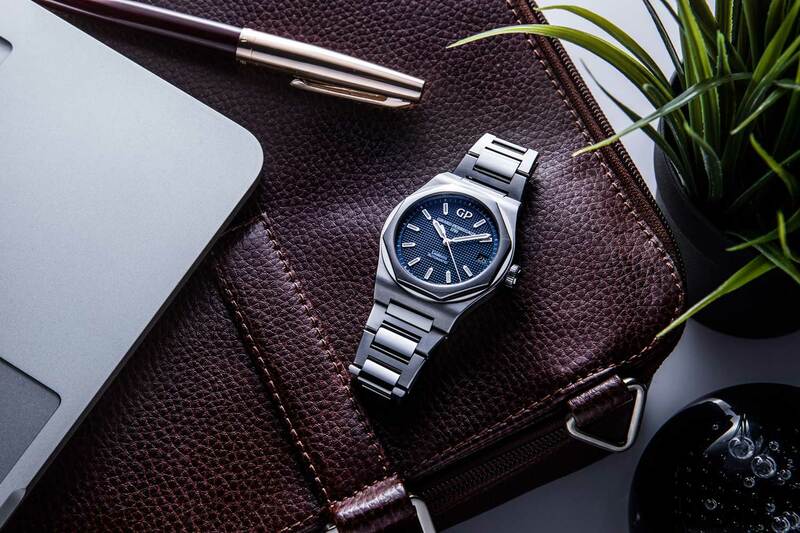 It is worth saying, though, that the reason why these three elements work so well within the watch is because the Laureato is a versatile design to being with. 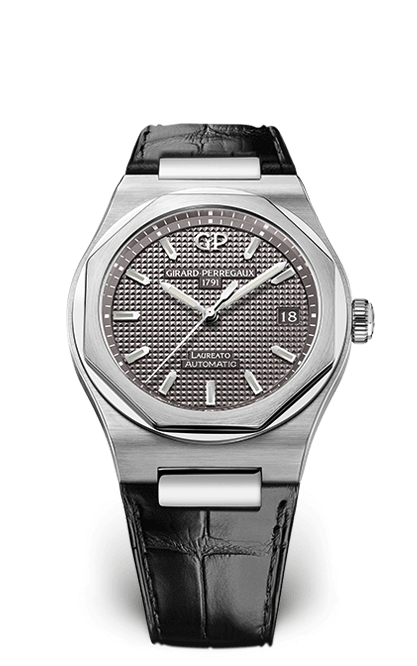 Which is why, just as the watch industry was coming out of the Quartz Crisis, it wasn’t difficult for Girard-Perregaux to rapidly build a collection around the Laureato. This is again the case, as of its recent reintroduction. In 2016, when Girard-Perregaux brought the Laureato back, we got one essential watch (41mm) with the faceted bezel and linked bracelet. It had the Clous de Paris dial of the 1975 original offered in two color options: A classic blue and a grey. Then just a year on, at SIHH 2017, the maison produced the watch in four case size variations: 34, 38, 42 and 45mm. Transposing the Laureato to these different sizes isn’t a difficult task, as a result of its basic design’s dexterity. 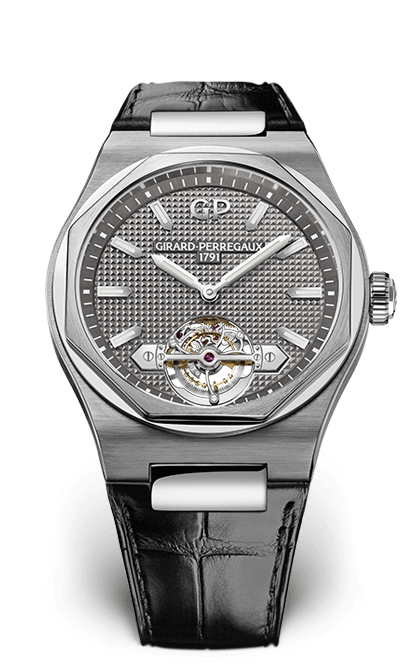 But understand that in the year that passed, along with expanding the collection, Girard-Perregaux took on an exercise of speaking to customers and retail partners — to receive hard feedback and criticism — to better the watch’s fundamental wearability. Why was this exercise important? Because the average 21st century watch buyer is on the lookout for versatility when considering buying a new timepiece. Versatility in the sense that the watch should be appropriate to wear no matter how formal, casual, sporty or completely informal the occasion, may be. 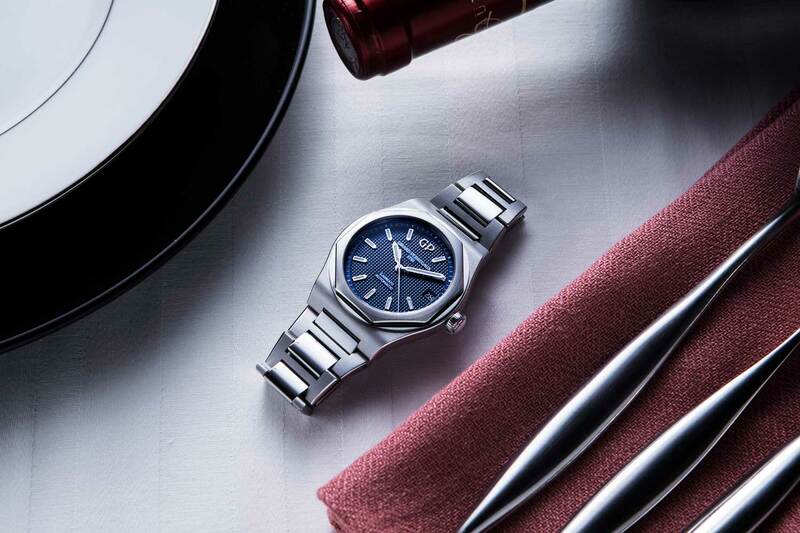 The Laureato holds every potential to be that watch for such modern watch buyers. However, if daily-wearability was a concern then all of its potential would be for naught. 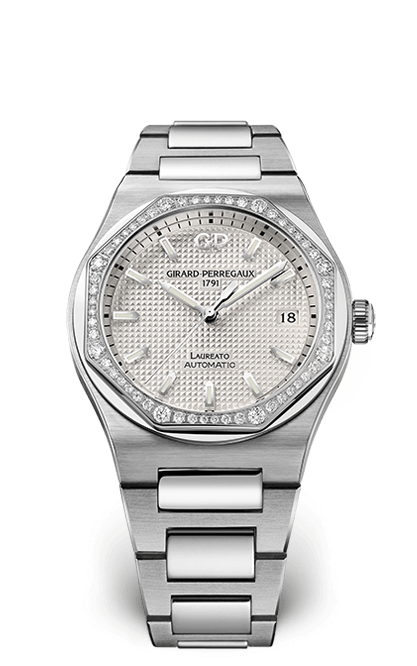 In its most diminutive size, 34mm — clearly targeted toward the lady watch buyer — the Laureato is available in steel, a duo-tone version in steel and 18k pink gold or an all 18k pink gold version with the option for a diamond set bezel (56 stones). Here’s where we, also, encounter the addition of leather straps with the watch as opposed to the linked bracelet we are familiar with. If you opt for the leather strap versions — not that you can’t swap them out from the bracelet versions — Girard-Perregaux also delivers these with an additional rubber strap. In its 38mm form, no duo-tone versions are offered, but the steel and 18k pink gold remain, with the option to go for a diamond set bezel. Next, the 42mm Laureato is offered in either steel or a duo-tone of titanium and 18k pink gold. This being the size option that most young contemporary gents are likely to lean toward for a daily-wearer, it’s good to know that the duo-tone is a clever mix of the 18k pink gold with titanium, which results in a vastly lighter watch than if it were a mix of the gold and steel. A welcome bit of forward thinking, especially for those looking at this version for an everyday watch. This is yet another strength of the present day Laureato collection. 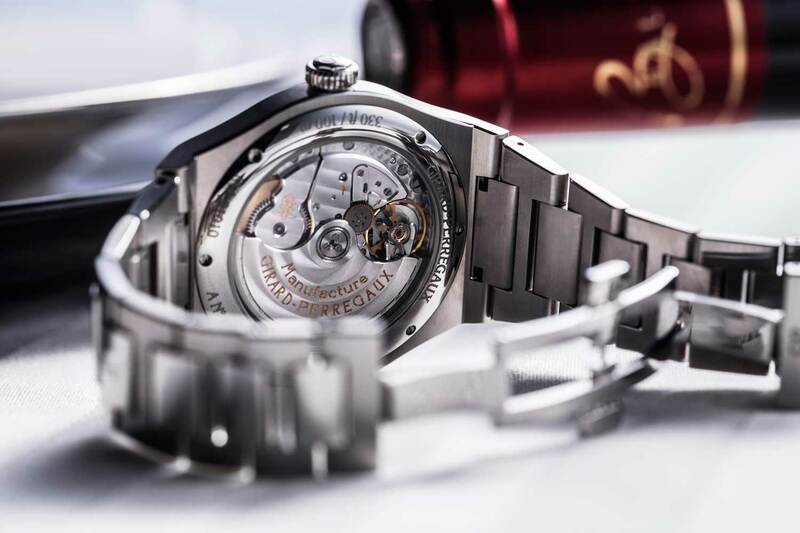 That every decision that Girard-Perregaux made in creating and expanding the collection has been driven by the need to make a compelling top choice for anyone looking to buy a daily wear watch. 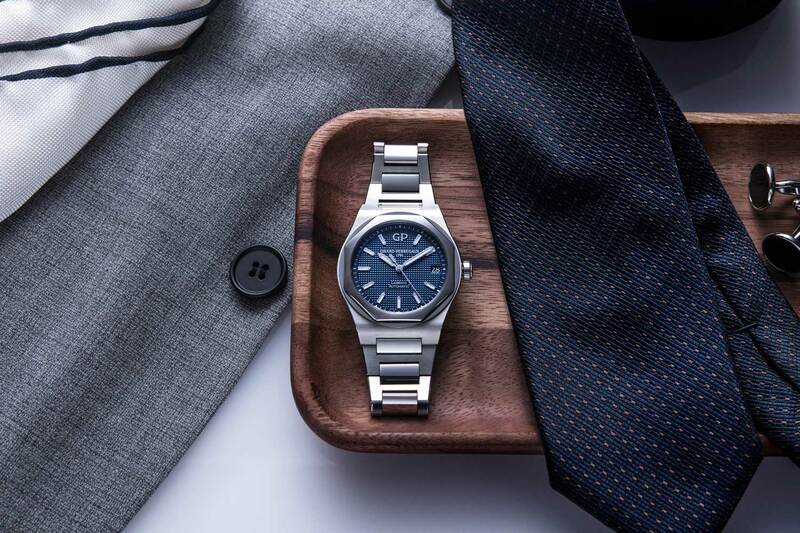 As a result, the Laureato is first a watch that is versatile enough that it would be a stylish, comfortable wear regardless of situations throughout a day, and secondly that there are enough variations of the watch that any personality and lifestyle should be able to find a fitting watch within the collection. 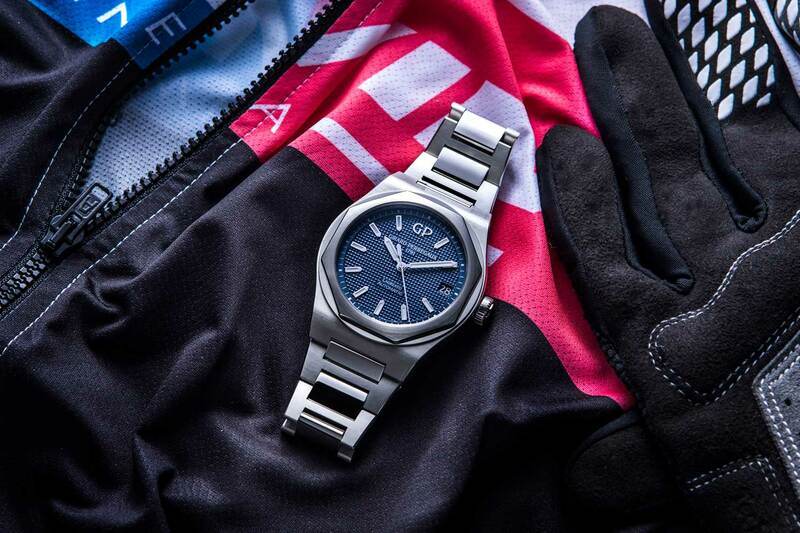 But say you’ve spent the dollar on an everyday Laureato and have developed such an appreciation for the watch that you would like to own another incarnation of it. 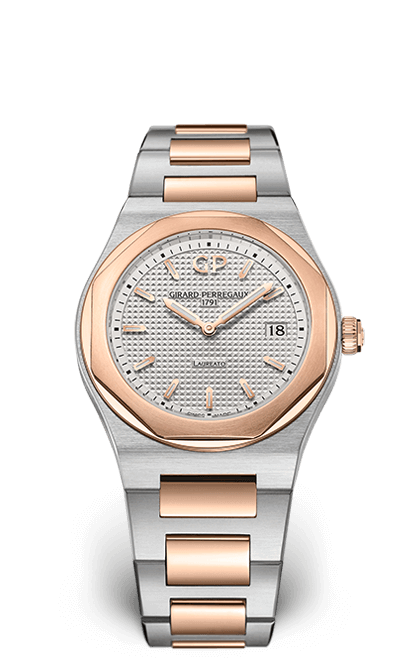 Girard-Perregaux, has thought of you, too. At its largest, 45mm, the Laureato exists in its Laureato Tourbillon form. Clearly this isn’t the one, someone would go for as an everyday option, which is why it’s the first watch in the collection we see without the date function. And it doesn’t simply have a tourbillon slapped onto the preceding versions. Rather, it’s commendable that while keeping the majority of the Clous de Paris dial, the one-minute tourbillon is incorporated into the watch using the tourbillon bridge of the brand’s famed three bridges. The Laureato Tourbillon comes in two essential versions. One, the clever mix of 18k pink gold with titanium and the other a mix of 18k white gold with titanium. The last addition to the collection was announced as recently as early May of 2017. This is the Laureato Skeleton, which stands as the most creative execution in the collection since its reintroduction last year. At 42mm, the watch is offered in a steel or 18k pink gold variation and strips away the Clous de Paris dial to reveal the GP01800-0006 skeletonised movement within. Unfortunately, some have made the argument that the watch is reminiscent of a few others already on the market. Thing we must all be aware of before making such a comment is that this formula of the faceted bezel and linked bracelet was a trendy approach to watch design for many a brand in the 1970s. So, most watches born of that decade are bound to share some similarities. 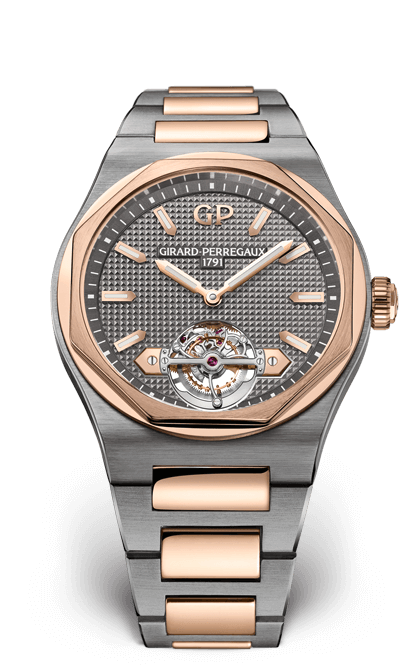 Of course, every designer and every brand added their own identity to this formula and, therein, Girard-Perregaux’s Laureato is no different and is as much deserving of your consideration as any other watch born of that decade. But look, you really don’t have to take our word for it. If the chance presents itself, try to visit a local Girard-Perregaux dealer to experience the present collection for yourself and understand why the Laureato stands its own ground in the story of the birth of the luxury sports watch. 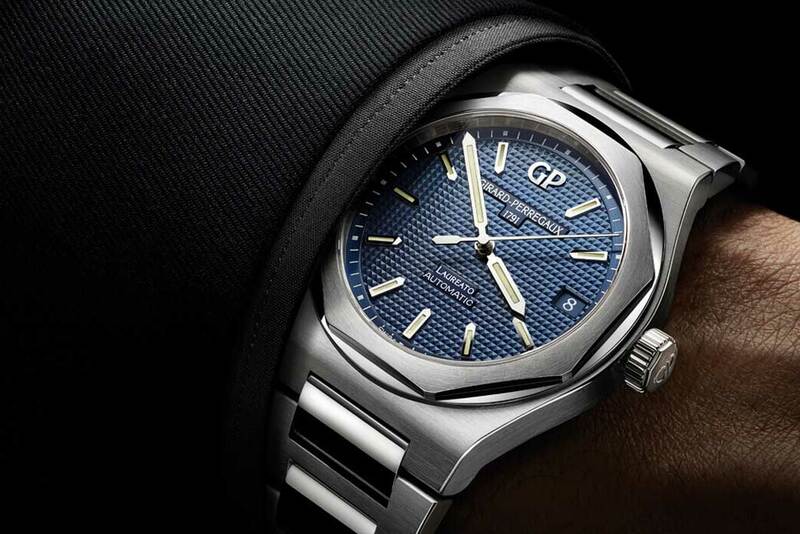 For those in Singapore, you’re in better luck still, because Girard-Perregaux along with The Hour Glass will be holding an exhibition of the Laureato tracking its evolution since its birth in 1975 all the way to the complete 2017 collection, from the 6th to the 16th July at the Ngee Ann City, level 1 atrium.